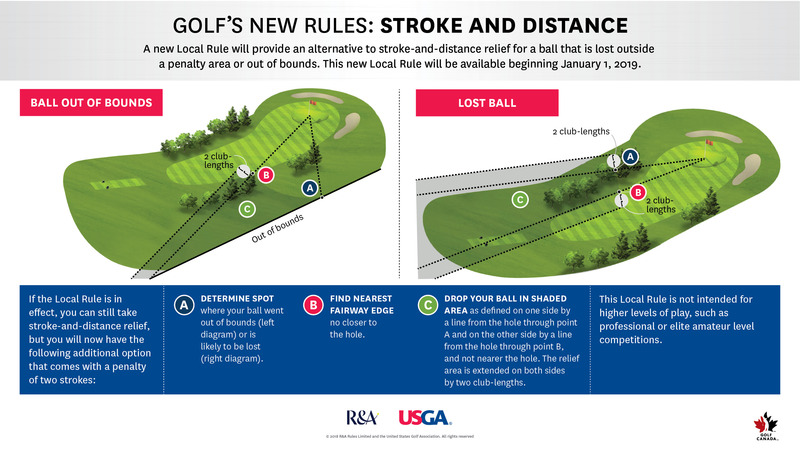 As you have heard, a historic reworking of the Rules of Golf came into effect on Jan. 1. 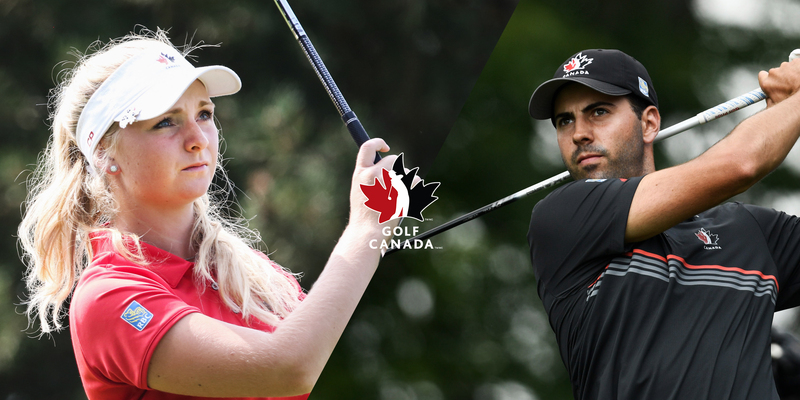 To gain a better understanding of how it affects recreational golfers like me, I invited Adam Helmer, Golf Canada’s director of Rules, competitions and amateur status, to play nine holes with me at my home club. While the round is fictional—it is minus 8 in Central Ontario and Midland G&CC is snow-covered as I write this—the new Rules are anything but. As usual, I crank my drive into the heavily wooded area on the left of the fairway. Although, again as usual, I am sure I will find it, Helmer reminds me I now have three minutes, not five as under the former Rule, to locate it. Nevertheless, with the unwarranted optimism that has always defined my game, I decline to hit a provisional and we walk down to the bush. No luck after the prescribed three minutes. I start the walk of shame back to the tee to accept the stroke-and-distance penalty. Wait, says Helmer, now there’s an alternative. 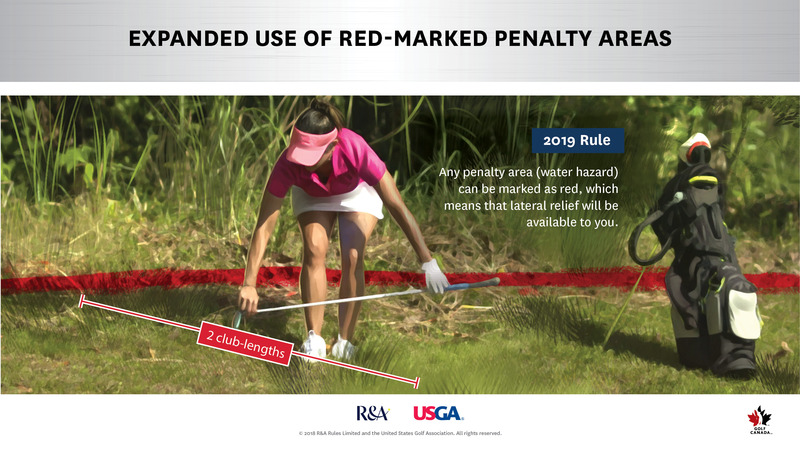 Your club has decided to institute a Local Rule which allows you to drop a ball in the nearest fairway under penalty of two strokes so you don’t have to hike back to the teeing ground. Ball lost. Time saved. The foursome behind us applauds the new Rules. You guys owe Helmer a beer. So do I. Indecisive over club selection (I’ve only been a member here for 30 years), I come up short and my ball dribbles into the hazard, not quite in and possibly playable. Oops, says Helmer, that’s no longer termed a “hazard,” but now called a “penalty area,” pointing out I now can ground my club, make practice swings touching the ground or growing objects and I can remove that pine cone or any other loose impediment near the ball. Instead of taking the 5-iron and laying up to the 100-yard marker, I try to impress Helmer, knocking the driver into one of the four bunkers protecting this (theoretically) drivable par-4. My ball is right up against the lip of the bunker and with my sand game being what it is, I ask Helmer what my options are. 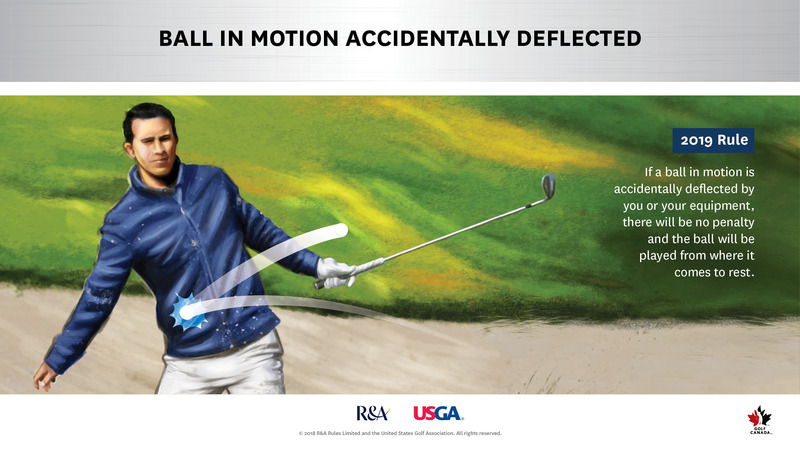 With a penalty of one stroke, I can drop the ball inside the bunker or, under the new Rules, drop it outside the bunker, taking a two-shot penalty. Additionally under the new Rules, you can remove loose impediments and touch the sand (provided you’re not testing the condition of the sand). 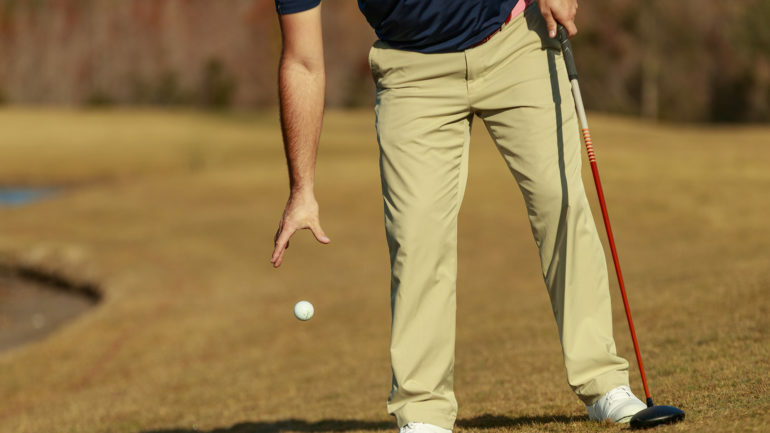 You are still prohibited from touching the sand during a practice swing, or right in front or behind the ball and during your backswing for your stroke. One of the toughest tee shots on the course to a kidney-shaped green that slopes severely from back to front and left to right. Uncharacteristically, I mash a drive but then hit a mid-iron to the back left of the green. Did I mention the pin position was front right? 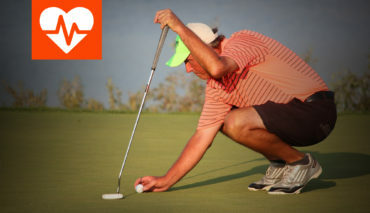 As I stand over the putt, I ask Helmer to tend the flagstick. Are you sure, he asks. 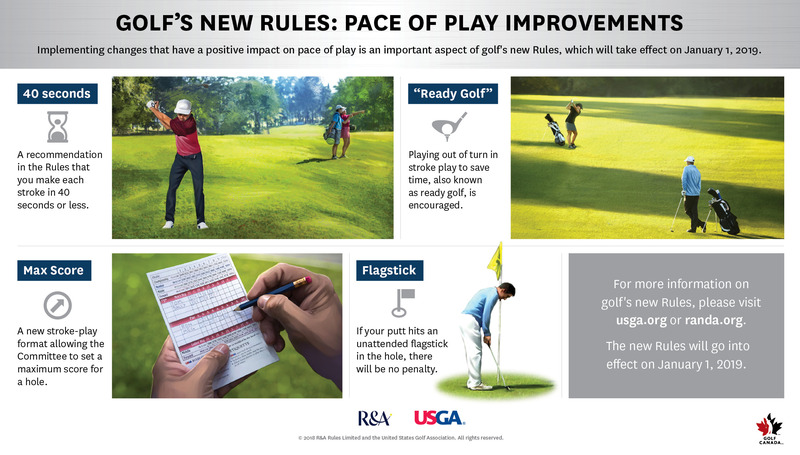 Under the new Rules, you can leave the flagstick in. I gratefully accept his advice. And, if my putt had come anywhere near the hole, I am sure it would have hit the stick and gone in. A nest of bunkers on the right always makes me err to the left where, of course, my ball is somewhere in the deep rough. As we are searching, I step on my ball and move it. No penalty under the new Rules! Just replace it where it was originally or estimate the spot if it’s unknown. Finally on a hole in regulation, only to discover that someone has dragged their shoes across my line of putt, making my putt more of a guessing game than Plinko. But, as Helmer points out, the new Rules allow me to tamp down these and other man-made damage to the green. Which I do. And miss the putt anyhow. Hook the tee shot into the trees left of the green. My imagined recovery shot, a low-running 4-iron off the back foot to inches, hits the only tree in front of me and ricochets off my bag. No penalty under the new Rules, says Helmer, even if it had hit me. My approach shot lands on the cart path to the right of the green. I take the proper relief and then start to drop the ball from shoulder height, as under the old Rules. Wait, says Helmer. The new Rule says you must drop the ball from knee height. Which I do. And then double-hit the ball. No penalty under the new Rules! As we wind up our round, I walk over to shake hands with Helmer and accidentally move my ball marker on the green. No problem under the new Rules. Just replace and carry on. We walked our nine holes in well under two hours thanks in large part to a commitment to “ready golf,” a practice that is emphasized under the new Rules. 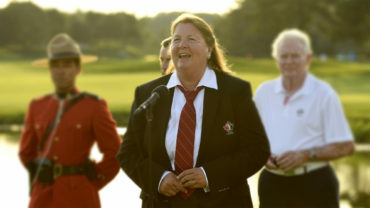 To learn more about the new Rules of Golf, visit www.golfcanada.ca/rules. 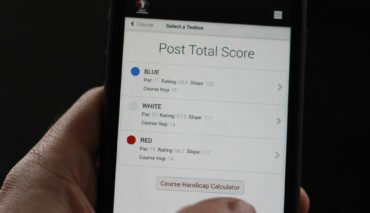 You’ll impress your fellow golfers and save strokes at the same time.